As far as the whole milk and cereal bar genre goes, this bar is far better than most. Tony's Cinnamon Krunchers is one of the better new cereals to have emerged in the last two years. It translates to bar form fairly successfully - maintaining the flavor that makes the cereal a winner. So many of the new cereal bars seems like dull candy bars (Cocoa Rice Krispies Cereal & Milk Bars, Cocoa Puffs Milk 'n Cereal Bars). The bars that make the grade are the ones with cereal that can be combined with the super sweet milk (frosting) and not have their namesake flavors blown away by the sugar. General Mills did it with their Cinnamon Toast Crunch Milk 'n Cereal Bars. And Kellogg's pulled it off with this product. As a spokesman for breakfast, my official recommendation is to avoid cereal bars altogether. It's a bad idea to reduce the most important meal of the day to a snack. 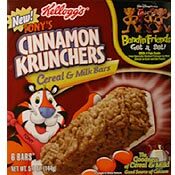 However, if you must have a cereal bar in the morning, definitely try Tony's Cinnamon Krunchers before one of the chocolate cereal varieties. $2.99 reflects the price of 5.1 ounce box containing 6 bars. What do you think of Tony's Cinnamon Krunchers Cereal & Milk Bars? They were Gr-r-reat! The commercial was about Tony the Tiger getting in a cannon and flying to the target with the milk. I want this gosh darn cereal to come back! WHY did u take the cereal away it was the best i couldn't get enough!!! 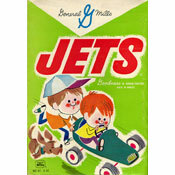 I LOVED THIS CEREAL!! I am so sad that it is gone. I want more of its deliciousness!!! What happened to this cereal? I miss these great flavors. Dude, cereal bars are awesome, have u not seen the nutrition facts? It also fills u up and tastes better than anything. I think cereal bars are nice like choclate ceral bars and I like teso`s cereal bars the craberry cereal bar.